Developed in 2016, diameter 1.2 mm (tip) & 0.75 mm (body). A wasp ovipositor is a needle-like structure composed out of three elements, called valves. A female wasp uses this structure to drill into wood or fruit and deposit eggs inside a living host. The propagation of the ovipositor through the substrate is achieved by a push-pull mechanism, in which one of the valves is pushed while the other two are pulled. Inspired by the ovipositor of parasitoid wasps, we developed a new Ovipositor Needle with a diameter of 1.2 mm at the tip and 0.75 mm along the body. 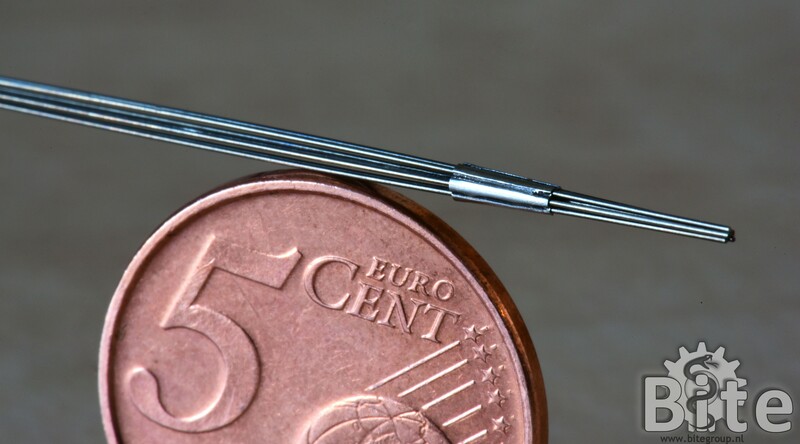 The needle consists of six superelastic Nickel Titanium (NiTi) wires (Ø 0.25 mm, length 160 mm) concentrically arranged around a seventh NiTi wire. The seven wires are interconnected at the tip with a flower-shaped ring (Ø 1.2 mm, length 2.0 mm), manufactured for minimal resistance during propulsion. The ring has a central hole to which the central wire is glued and six holes through which the six other wires can slide back and forth. 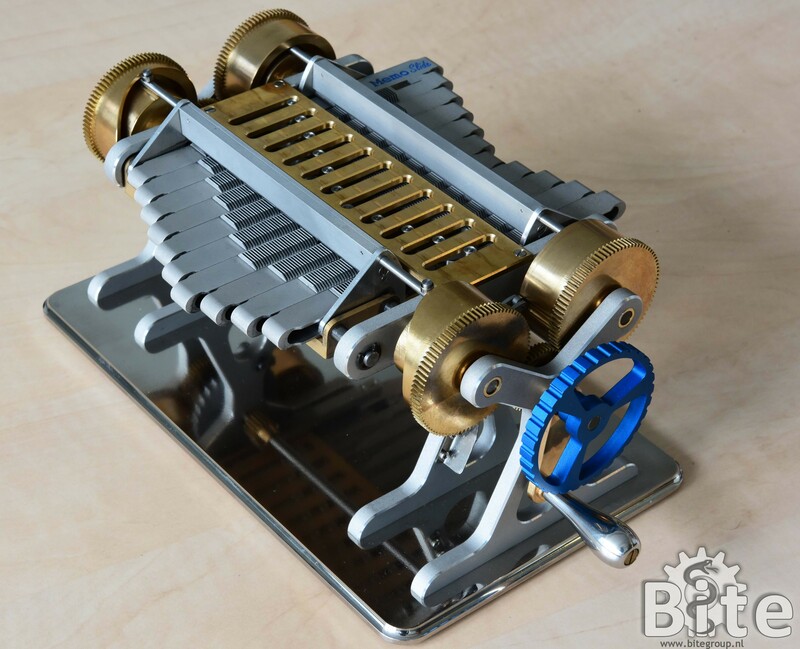 Each proximal end of the six movable wires is connected to a stepper motor, in which a leadscrew-slider mechanism converts rotational motion into linear motion. During an experiment, the needle was inserted in a stationary tissue-mimicking phantom, placed on a cart with low-friction wheels. The wires were sequentially moved back and forth inside the phantom, generating a net pulling motion of the phantom towards the actuation unit, and resulting in the needle moving forward inside the phantom. Different sequences of wire actuation were used to achieve both straight, curved and S-shaped trajectories. In a follow-up prototype we changed the shape of the interlocking ring from cylindrical to conical to investigate the effect of pre-curved wires. We found out that pre-curved wires facilitate steering, however, at the drawback of a slightly larger tip diameter due to the use of a conical flower-ring. 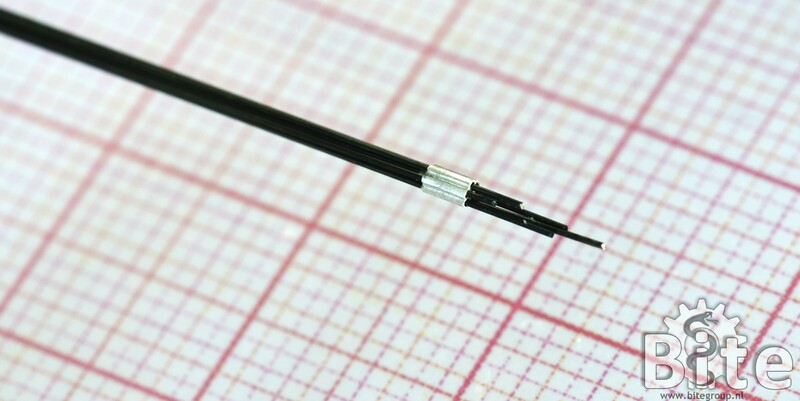 Ovipoistor Needle II is, to our knowledge, world’s thinnest self-propelled-steerable needle. 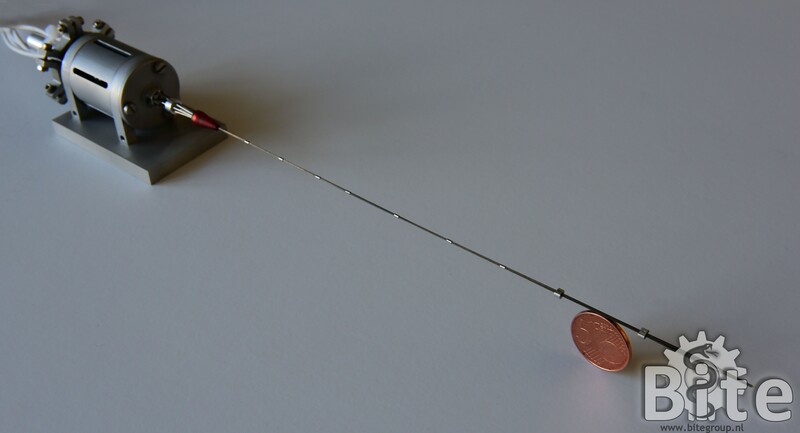 Our novel bio-inspired steering and propulsion mechanism allows for the design of extremely long and thin needles that can be used to reach deep targets inside the body without a risk of buckling and with the possibility to correct the trajectory. Ovipositor Needle II is part of the WASP project that focuses on the development of steerable needles for localized therapeutic drug delivery or tissue sample removal (biopsy). We are currently working on further miniaturization to diameters <0.5 mm. Scali M., Pusch T.P., Breedveld P., Dodou D. (2017), Ovipositor-inspired steerable needle: design and preliminary experimental evaluation, Bioinspiration & Biomimetics, Vol. 13, No.1. Scali M., Kreeft D., Breedveld P., Dodou D. (2017). 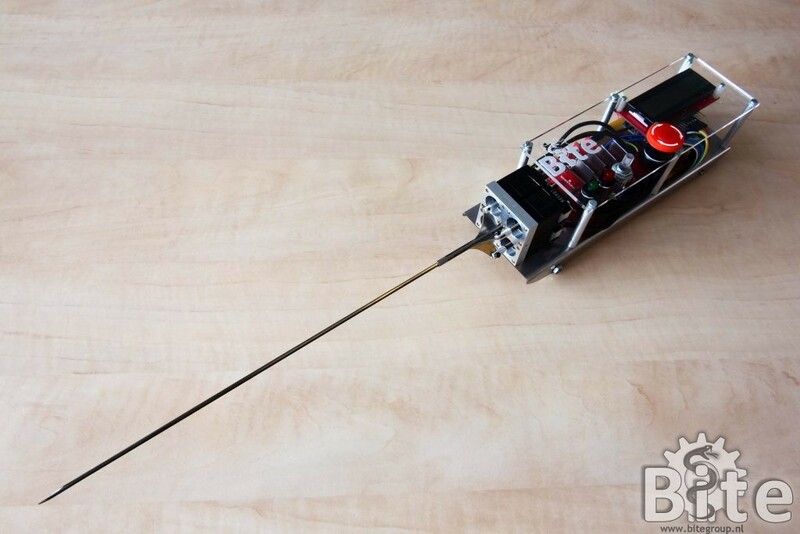 Design and evaluation of a wasp-inspired steerable needle. Proc. SPIE 10162, Bioinspiration, Biomimetics, and Bioreplication, 1016207, doi:10.1117/12.2259978. Developed in 2014, thickness 2 mm. Wasp ovipositors are thin and flexible needle-like structures used for laying eggs inside wood or larvae. Wasp ovipositors are composed out of longitudinal segments, called “valves”, that can be actuated individually and independently of each other with musculature located in the abdomen of the insect. In this way the wasp can steer the ovipositor along curved trajectories inside different substrates without a need for rotatory motion or axial push. Inspired by the anatomy of wasp ovipositors, we developed an Ovipositor Needle containing a 2 mm thick “needle” composed out of four sharp and polished stainless steel rods, representing four ovipositor valves. 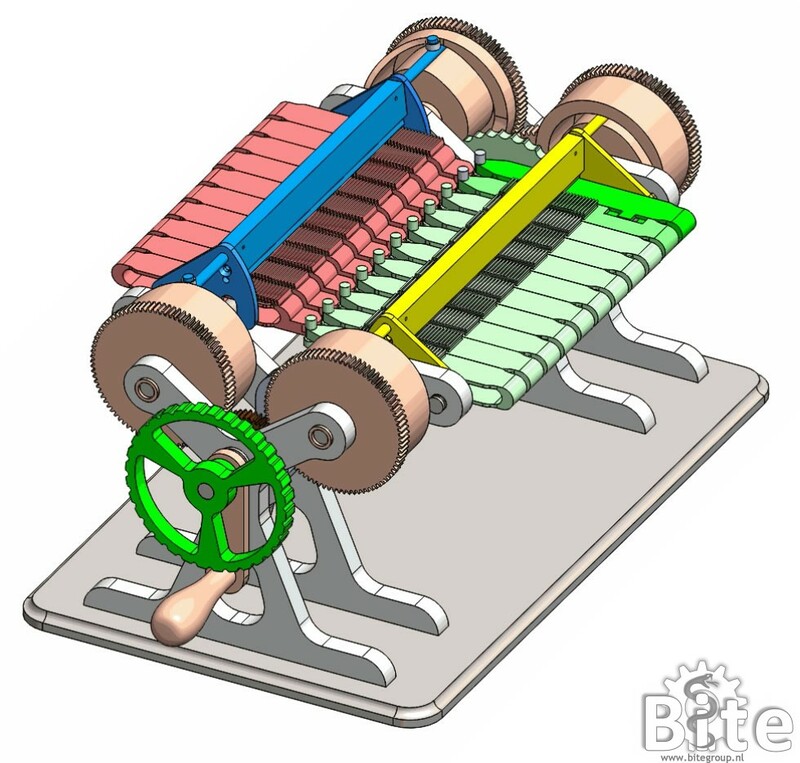 The four valves can be individually moved forward and backward by means of electromechanical actuators mounted in a propulsion unit that is standing on four passive wheels. 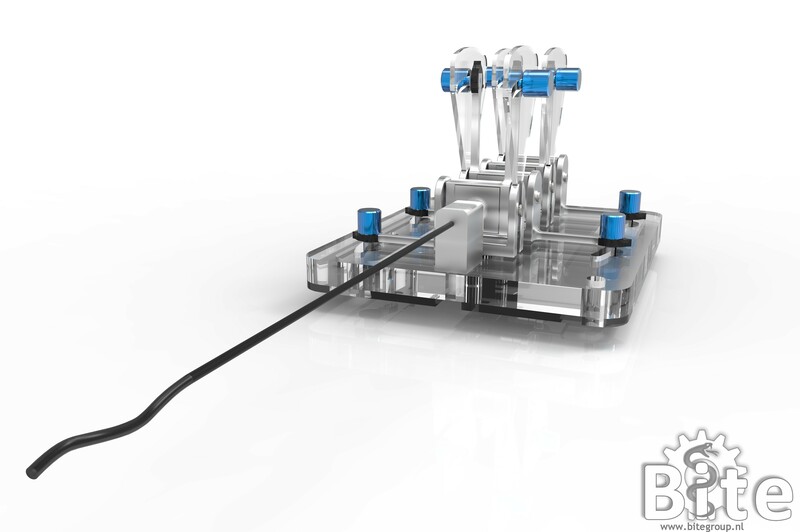 If the needle is inserted into a gel that represents tissue, and if the four valves are sequentially moved forward and backward, the friction behaviour around the valves in the gel will result in a net pulling motion that drives the needle forward through the gel. 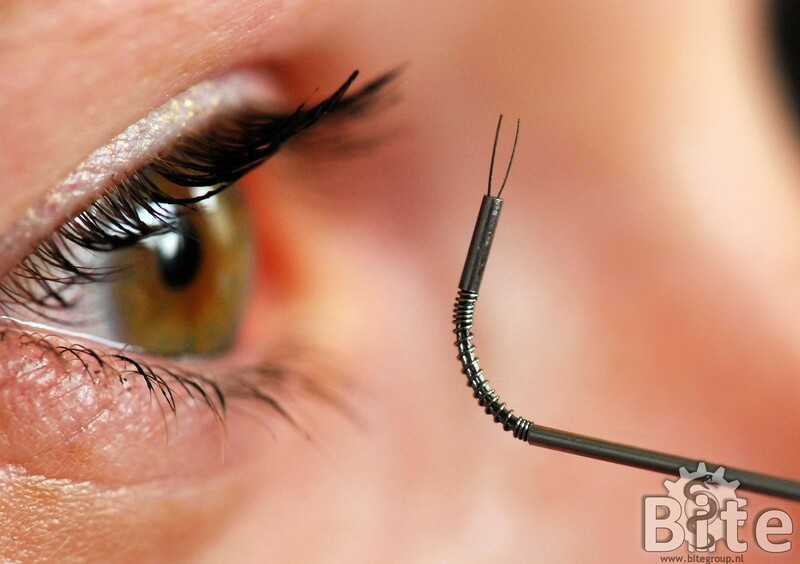 The ovipositor needle is therefore self-propelling, meaning that it does not need a net pushing motion for moving forward through tissue like normal needles do. Ovipositor Needle I is part of the WASP project that focuses on the development of steerable needles for localized therapeutic drug delivery or tissue sample removal (biopsy). 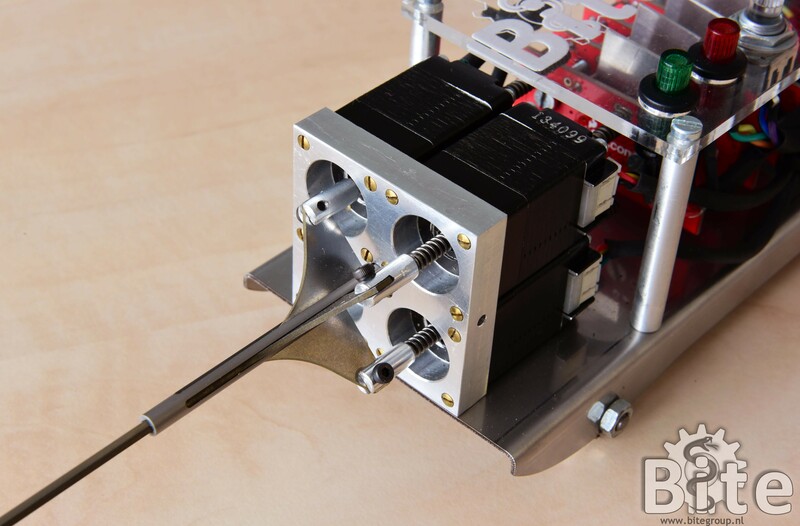 In a new prototype that is currently under development, we aim to extend the self-propelled needle with steering capabilities at an outer diameter of just 1 mm. Sprang T., Breedveld P., Dodou D. (2016). Wasp-inspired needle insertion with low net push force. Proc. 5th International Conference on Biomimetic and Biohybrid Systems (Living Machines 2016), July 19-22, Dynamic Earth, Edinburgh, Scotland, UK, 12 p.
Developed in 2012-2015, thickness 5 mm, steering range: ±90º in all directions, complex components made by 3D-printing. 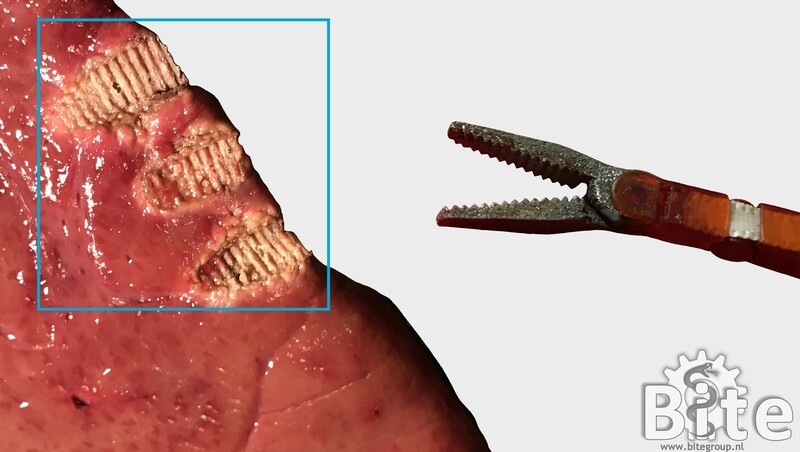 The DragonFlex has been developed in close-collaboration with Dr. Filip Jelinek, former PhD from the BITE-Group and currently employed at ACMIT. 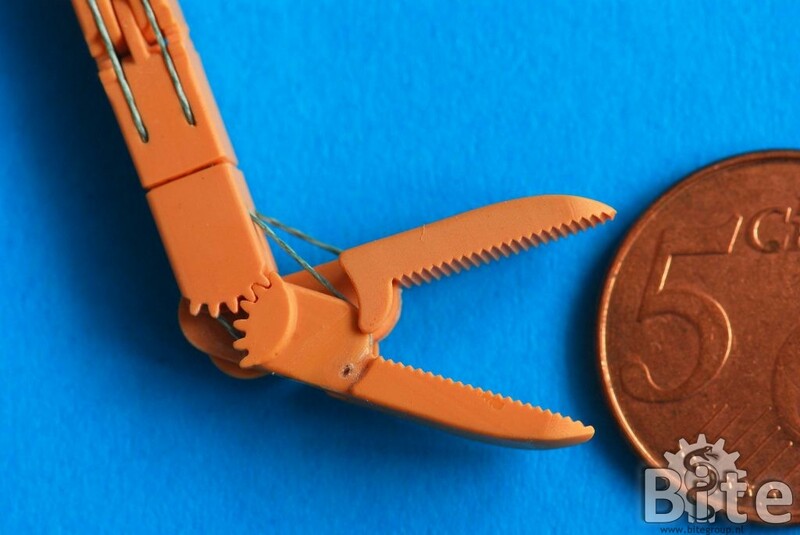 In follow-up of the successful DragonFlex Macro, the DragonFlex Micro has been miniaturized to a 5 mm scale, where special attention has been given to the reliability and precision of the mechanism and optimization of the 3D-printing technique for such small scale components. 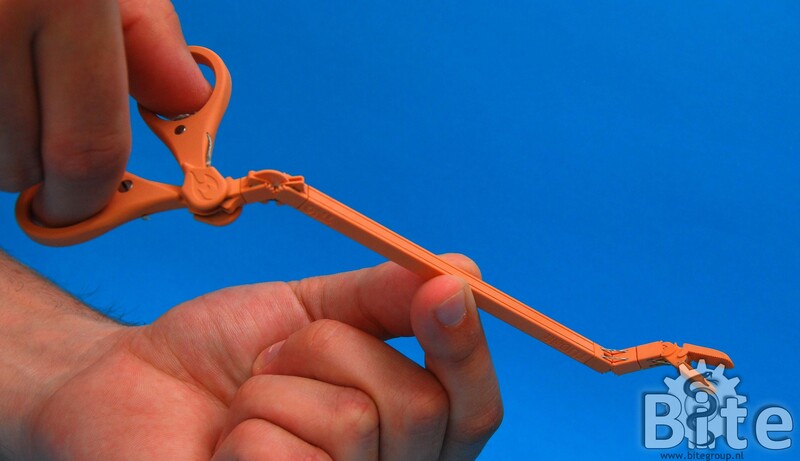 Developing and optimising new design methodologies for 3D-printing, a number of prototypes have been manufactured from different materials, resulting in world’s first steerable surgical instrument made entirely by 3D printing. Jelinek F., Breedveld P. (2015). Design for additive manufacture of fine medical instrumentation: DragonFlex case study. ASME Journal of Mechanical Design, Vol. 137, No. 11, pp. 111416-1–7. Jelinek F., Arkenbout E.A., Henselmans P.W.J., Pessers R., Breedveld P. (2015). Classification of Joints Used in Steerable Instruments for Minimally Invasive Surgery. ASME Journal of Medical Devices, Vol. 9, March 2015, pp. 010801-1-010801-11. Jelinek F., Diepens T., Dobbenga S., Jagt G. van der, Kreeft D., Smid A., Pessers R., Breedveld P. (2014). Method for minimizing rolling joint play in the steerable laparoscopic instrument prototype DragonFlex. Minimally Invasive Therapy, 2014, Early Online, 1-8. Jelinek F., Gerboni G., Henselmans P.W.J., Pessers R., Breedveld P. (2014). Attaining high bending stiffness by full articulation in steerable minimally invasive surgical instruments. Minimally Invasive Therapy, 2014, Early Online, 1-9. Jelinek F., Pessers R., Breedveld P. (2014). DragonFlex Smart Steerable Laparoscopic Instrument. ASME Journal of Medical Devices, Vol. 8, March 2014, pp. 015001-1-015001-9. Jelinek F., Breedveld P. (2013). DragonFlex – Smart steerable laparoscopic instrument. ASME Journal of Medical Devices, Vol. 7, June 2013, pp. 020911-1-020911-2 (also published in Proc. 2013 ASME Design of Medical Devices Conference, April 8-11, Minneapolis, MN, USA). Jelinek F., Dobbenga S., Jagt G. van de, Kreeft D., Smid A., Pessers R., Breedveld P. (2013). The method for minimizing the rolling joint play in the steerable laparoscopic instrument prototype – DragonFlex. Proc. ASME Design of Medical Devices Conference – Europe Edition 2013, Oct. 7-9, Aula Conference Centre, TU Delft, Delft, the Netherlands, 1 p.
Jelinek F., Dobbenga S., Jagt G. van de, Kreeft D., Smid A., Pessers R., Breedveld P. (2013). The method for minimizing the rolling joint play in the steerable laparoscopic instrument prototype – DragonFlex. Proc. 25th International Conference of Society for Medical innovation and Technology (SMIT), Sept. 5-7, Baden-Baden, Germany, 1 p.
Jelinek F., Pessers R., Breedveld P. (2013). DragonFlex – smart and simple steerable laparoscopic instrument. Abstr. 4rd Dutch Bio-Medical Engineering Conference, Jan. 24-25, Egmond aan Zee, the Netherlands, 1 p.
Developed in 2010-2011, thickness 15 mm, steering range: ±90º in all directions, made entirely by 3D-printing. Despite its success, e.g. in prostatectomy, da Vinci’s steerable grasper EndoWrist from Intuitive Surgical has a complex design prone to steel cable fatigue, potential sterilization issues and high associated costs, all of which insinuate a need for an alternative. 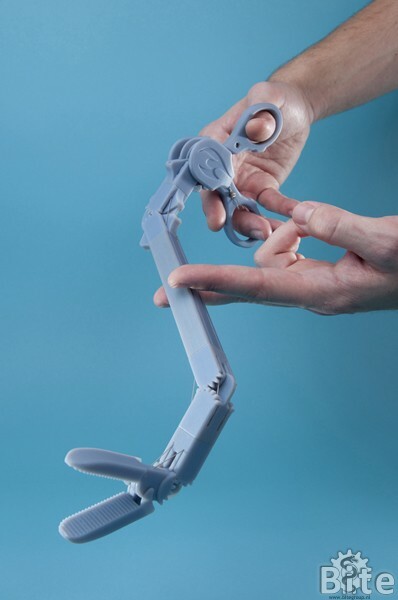 The aim of our DragonFlex project is to demonstrate a design of a structurally simple handheld steerable laparoscopic grasping forceps free from cable fatigue, while attaining sufficient bending stiffness for surgery and improving on EndoWrist’s maneuverability and dimensions. 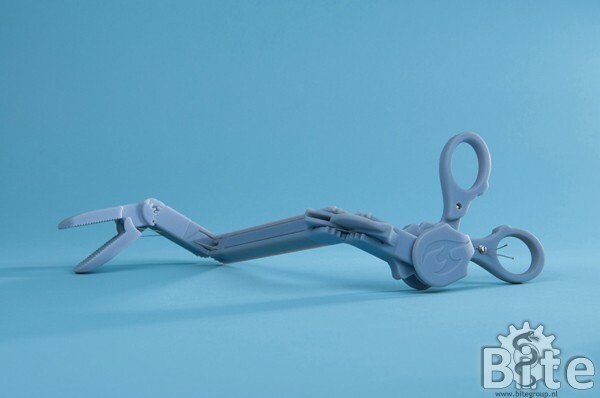 Having equal joint functionality to EndoWrist, DragonFlex’s instrument tip contains only four parts, driven and bound by two cables mechanically fixed in the handle. Two orthogonal planar joints feature an innovative rolling link mechanism allowing the cables to follow circular arc profiles of a diameter 1.5 times larger than the width of the instrument shaft. Besides maximizing the cable lifespan, the rolling link was designed to equalize the force requirements on both cables throughout joint rotation, making the handling fluid and effortless. The smart stacked joint design enables control of seven Degrees of Freedom (DOF) by only two cables and seven instrument components in tip, shaft and handgrip altogether. 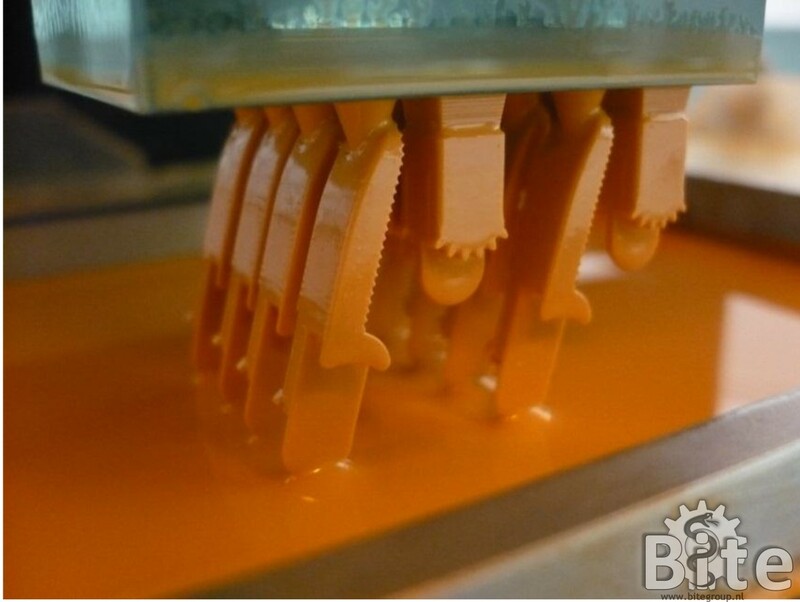 The DragonFlex prototype was developed by means of 3D-printing, allowing grasping and omnidirectional steering over ±90°, exhibiting promisingly high bending stiffness and featuring extreme simplicity. 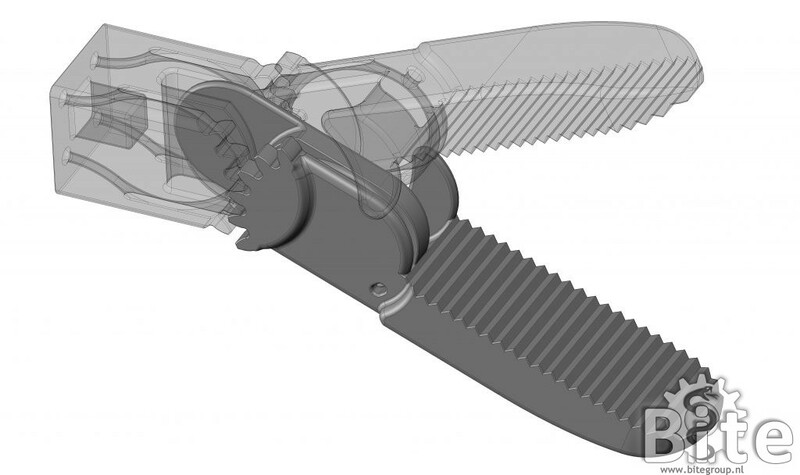 DragonFlex concept sheds new light on the possibilities of additive manufacturing of surgical instruments, allowing for a feature-packed design, simple assembly, suitability for disposable use and potential MRI compatibility. Developed in 2007-2008, diameter 0.9 mm, steering range: ±90º in all directions. The retina is a light-sensitive layer at the inside of the eye. The macula is the region at the center of the retina with the highest concentration of light-sensitive cells. Macula degeneration – a disease which is a major cause of blindness – is caused by a disfunctioning choroid layer under the macula. A way to treat macula degeneration is to perform surgery to the choroid layer via a tiny incision in the retina near the macula. 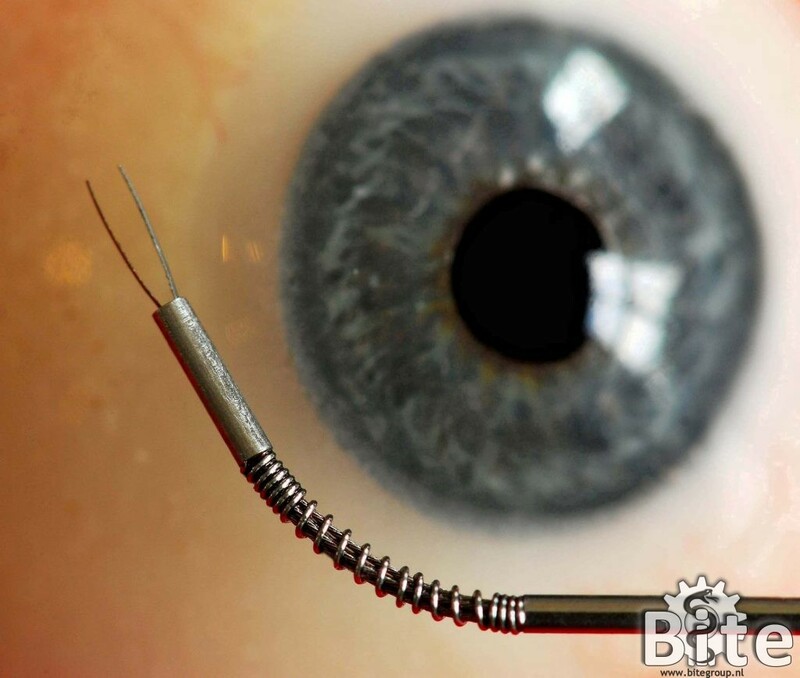 Reaching the choroid layer under the macula is extremely difficult as the surgeon has to operate through the incision under an angle while avoiding damage to the extremely delicate macula layer. 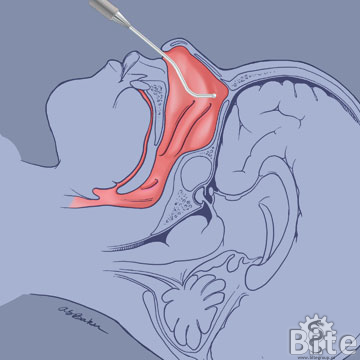 A steerable instrument could potentially solve this issue by making it easier to steer the instrument through the incision. 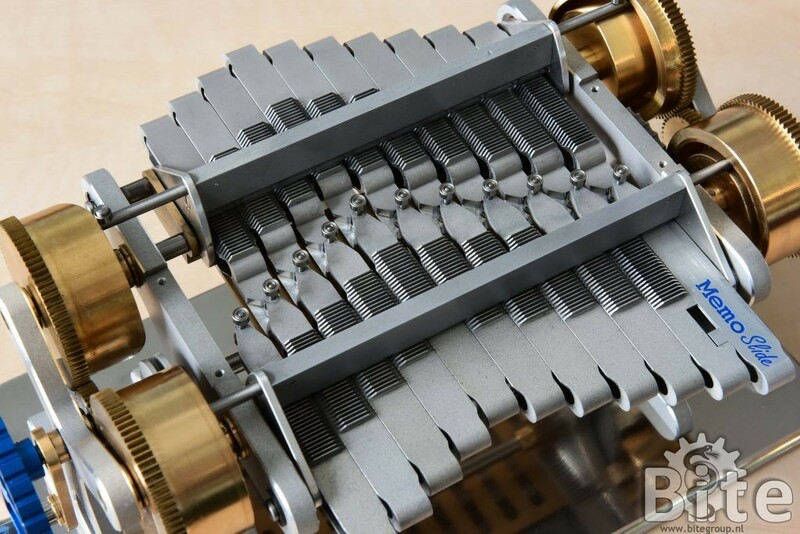 The largest design and fabrication challenge of such an instrument is the extreme miniaturization of the steerable mechanism in the tip. 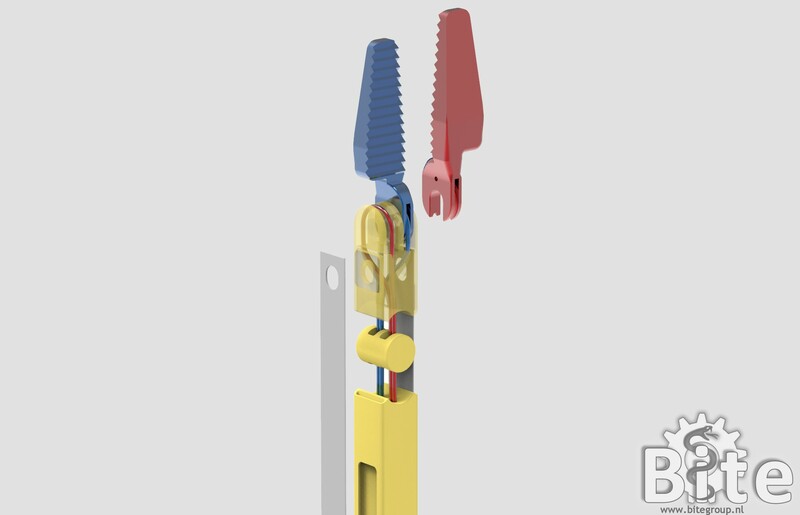 Down-scaling our patented Cable-Ring mechanism, already applied in the Endo-Periscope III and MicroFlex, to a very small scale, resulted in the I-Flex – world’s smallest steerable surgical instrument that can be steered in all directions. 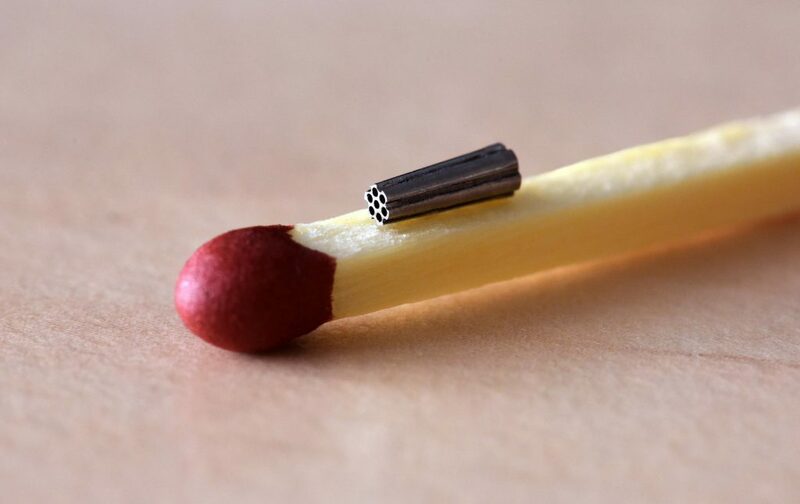 The compliant tip has a diameter of only 0.9 mm and is constructed from 7 steel cables and a spring. 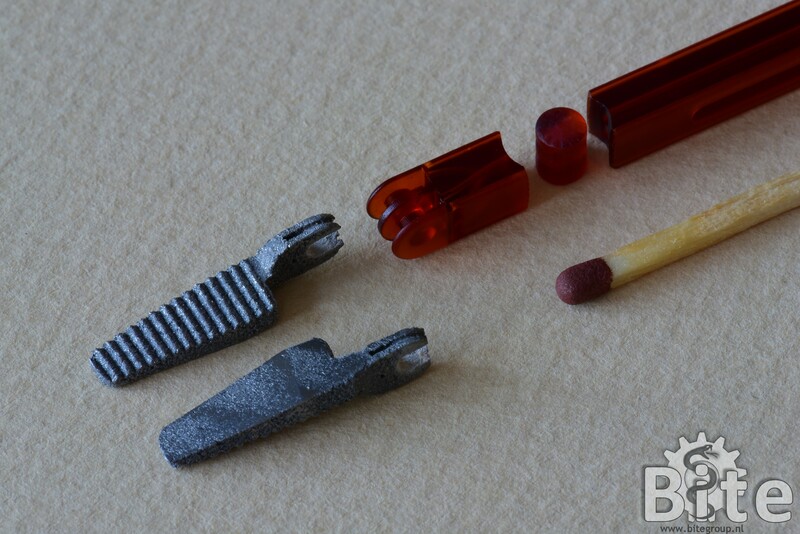 Being equipped with a tiny gripper, the tip can be steered in two Degrees of Freedom (DOF). The instrument contains a novel handle that combines intuitive steering with a fine and precise pincer grip. Feedback of experienced eye-surgeons from the Eye Hospital in Rotterdam has led to the development of a second prototype which is currently under construction. 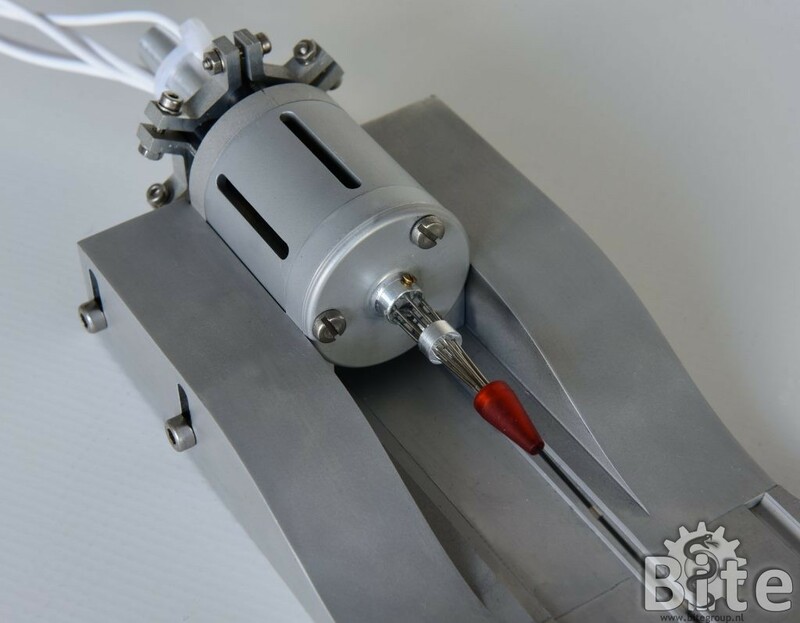 This instrument incorporates a different handle, allowing further miniaturization of the steerable tip to a diameter of only 0.45 mm – three times the size of a human hair.